Heat stroke is a very serious condition and it is important that owners do all they can to keep their dogs cool when temperatures soar. Because dogs are only able to lose a small amount of heat naturally, cooling vests are the ideal solution. The best dog cooling vests are comfortable and easy to get on and off your dog. Once you have invested in a dog cooling vest you can use it when you are out for walks in the summer months. Some need to be stored in the freezer but others start to work as soon as you wet them. It is important that you get one that is a snug fit for your dog so that it will work properly. The best cooling vests for dogs can be machine washed and they are very durable so they can be used repeatedly which represents great value for money. 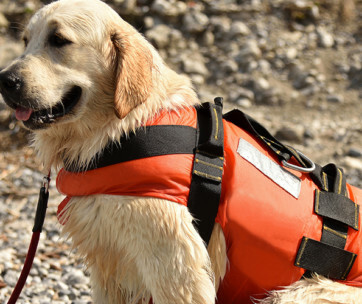 You have a lot of choice when it comes to selecting the best dog cooling vests so before you buy, take a look at our guide to finding the best for your pooch. This Ruffwear cooling vest works via evaporation so it will keep your dog cool in the same way as sweating cools down humans. It is very easy to use and is always ready – you simply have to soak it in cold water and wring it out a little so that it is not dripping. Then you fasten it onto your dog using the autolock buckles and they will love it! There are multiple layers that work together to allow water to escape and take the heat away from your dog’s body. 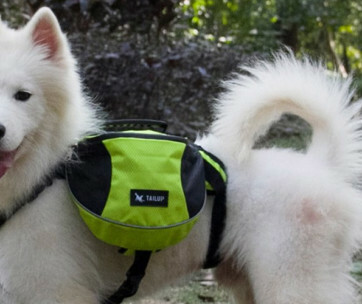 You can use it with a harness from Ruffwear and it comes in six sizes. It is a pale color to reflect light and has brightly colored panels to improve safety. When you get back home, pop it in the washing machine on a cool cycle. Light grey with bright panels for safety. Perfect for a hot day, this cooling vest is lightweight and made out of a pale material to deflect sunlight away from your dog’s body. It cools by evaporation and needs to be wet to work. It includes a layer of cotton that holds water at a comfortable distance from the skin and the mesh layer distributes the evaporative effect. This cooling shirt for dogs provides UV protection, has a leash attachment and is secured on using a zipper. You can adjust the size and the neck opening and there are reflective strips. It can be machine washed. If you are looking for a simple and lightweight cooling vest this could be the product for you. It is blue in color and works by water evaporation. The ice vest for dogs has been designed using Coolfresh technology which has a netting material. This ultra-absorbent fabric is very efficient at spreading the cooling effect across your dog’s entire body. For when the sunlight is very strong, the cooling shirt for dogs is reflective and it has been shown to maintain the core of a dog’s body at 50 degrees F lower than the air temperature. There are several sizes for you to choose from. You get two products for the price of one here because the pack includes a cooling vest and a matching collar – everything you need for dog cooling on a hot day. They both have to be pre-frozen and keep your dog cool by using up heat energy as the ice turns back into water thanks to FlexiFreeze® technology. The water inside the vest has been sourced from an area around the Great Lakes in the USA for purity. Because you will not be relying on evaporation, this vest is great if you live in an area where the humidity is high. It has a classic look and is available in four sizes. There are no clunky buckles and it is simple to clean. Here we have a cooling vest that works by evaporation. It comes in a light grey and blue color which is good at reflecting heat on sunny days. The mesh nylon fabric is very absorbent and distributes the cooling effect well but does not contain any hazardous chemicals and is completely safe. To keep your dog safe at night, there is a light-reflective strip on the vest and there are adjustable straps which help you get a snug and comfortable fit. When you wash it out it needs to be air dried. It comes in just one size which is suitable for the majority of medium-sized breeds. 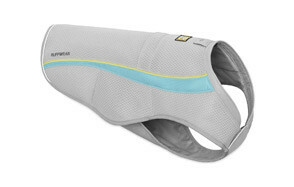 This is a great cooling vest for dogs who like to exercise for long periods. It will keep the bright sunlight off your dog and keep them cool at the same time. All you have to do is wet it and it is ready to fit on your dog. The vest has multiple layers so it is able to absorb a lot of water and still maintain its structure. It is a robust and durable product that will withstand everything your dog gets up to! You don’t have to worry about sunlight exposure because this vest offers a sun protection factor of 50+. You can pop it on and take it off easily thanks to the zipper and it moves in harmony with your dog’s body so active dogs will love it. You can order it in six sizes. This manufacturer has gone to a lot of effort to make sure that this vest fits your pooch because they offer it in nine sizes. They provide a useful size guide so you don’t have to hazard a guess about the size. It is made from a soft and flexible material. When you wet it, you get a cooling effect that keeps your dog comfortable. The fabric is extra absorbent so that it can hold more water and keep your dog cooler for longer. The smaller sizes have attachment loops so that you can fit a leash to them and it will act as a harness as well as a cooling vest. This product is highly suitable for smaller or active dogs who do not like to carry a lot of extra weight around. It works through the evaporation method so all you have to do is wet it and it starts working immediately. It fixes on securely using a strap made of Velcro which is sewn on the back and because it is available in three sizes you should be able to get just the right fit. This vest has been made with totally non-toxic material which is 100 percent safe for all dogs. You can get sizes to fit Boston Terriers through to Labradors. It is made from a light color so it will reflect sunlight which helps to keep your dog cool. You can use it repeatedly and it is very easy to wash.
A bright orange cooling vest that is available in four sizes. It is bright enough to be seen clearly at night and has a reflective strap for added safety. It is also highly heat reflective and so will help to keep your dog cool in bright sunlight. Because it is very soft and lightweight, it will not restrict the way that your dog moves around and it deflects UV light and prevents sunburn. It is constructed from three layers of carefully designed fabric and it works using the evaporative cooling method. The absorbent cotton material holds all the water and the two layers of mesh wicking material distribute the cooling effect around your dog’s skin. There is an adjustable buckle so that you can perfect the fit. This is a brightly colored cooling jacket that uses a combination of polyester with nylon and cotton to produce an effective evaporative cooling effect. The materials are all completely non-toxic and totally safe for your pooch. 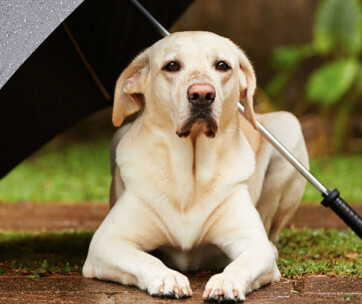 Dogs love to put it on when the weather is hot because it is soft and flexible and moves with their body. It is also very lightweight yet durable. 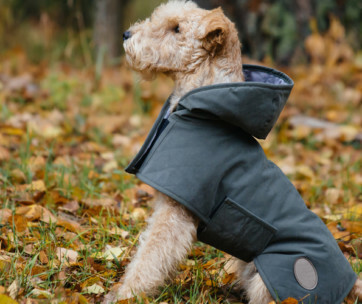 This dog cooling jacket comes in four sizes and the brand gives you a handy size guide to use a reference. Because the outer layer of fabric is so reflective, it will protect your dog from sunburn as well as keeping them cool. You fix it on securely using the zipper and strong plastic clip. You will be given a lot of choice when you set out to buy a dog cooling vest so here is a useful guide to what you should be looking for. The last thing you need is a vest that is fiddly and time-consuming to put on and take off your dog. Many come with Velcro straps which are the fastest way to secure the vest and have no edges that can pinch the skin. Other owners like to have a zipper or even clips as they make the vest very secure when the dog is wearing it. The whole point of a dog vest is that it makes your dog more comfortable so it must fit them well. It should not restrict movement in any way and should not have any loose bits that flap around when they are running around. Therefore, look out for a brand that supplies vests in a range of sizes. Vests that come with straps that are adjustable are even better. Remember that you need to look carefully at the ‘Size Guide’ but also look at customer reviews to see if the sizes are accurate. The best quality cooling vests are made from ‘breathable’ materials that will let air filter down to your dog’s skin. Cotton is one excellent option and it can also absorb a large volume of water. Cooling vests for dogs must be made out of materials that are non-toxic so that they will not make your dog ill if they decide to chew them! To encourage your dog to wear the vest, it must also be made out of soft materials that are lightweight. Often, the vest will feel softer when it has been soaked in water. It is also important that the holes in the fabric will allow water vapor to pass through. Wicking material is ideal for this. It will stop your dog from having to spend all day with wet skin. This may seem obvious but you need a vest that will not dry out too quickly. When you are out for the day, you need one that will carry on cooling your dog down for several hours. Remember that the vest will dry out quickly in arid and windy conditions and that bright sunlight will also affect how long it works for. The infrared and UV light in bright sunlight can give dogs sunburn and this is both dangerous and uncomfortable for them. Therefore, it’s a good idea to get a vest that features UV resistance. Many vests are also made of material that is a light color and that will reflect the heat in sunlight. They help to keep your pooch cool. Reflective strips are a useful feature and will help your dog to be clearly visible at night and when out walking in poor light. They are especially important when walking near a highway. 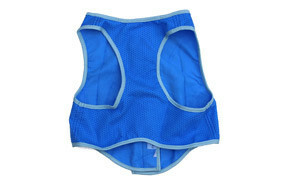 Many dog cooling vests have been very carefully designed and have useful features. 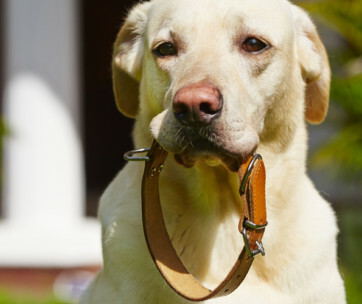 One of these is the ability to wear an existing collar and leash with it and others have a leash clip that is integral to the design. Dogs that are very active may prefer a lightweight design that is less restrictive and will allow them to move around freely. Other dogs may be perfectly satisfied with a larger vest. Heat exhaustion is a very real health concern for dogs. The medical term for it is hyperthermia which simply means being way too hot! The problem for dogs is that they have a thick fur coat on all of the time. This is fantastic in cold weather conditions because it is very good at trapping air on top of the skin. This stops warm air from escaping and keeps the surface of the skin hot. In turn, this helps to maintain an ideal body temperature. The problem is that it carries on doing this even when the weather is warm and your dog’s body cannot get rid of excess heat. The main benefit of a dog cooling vest is that it will cool your dog down. It is portable (so its better than an air conditioning unit) and it carries on working when your dog is out for a walk (which is more flexible than a cooling pad). 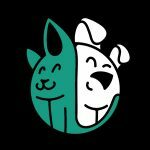 So, why is it so important to cool your dog down? Why dogs get so hot! It is surprisingly hard to keep a dog cool because the fur traps heat in the body. Therefore, the sensible approach is to prevent your dog from getting overheated to begin with! It is not true that dogs don’t sweat. They have merocrine sweat glands on the pads of their paws but they are not very effective as a cooling mechanism. A dog’s main cooling strategy is panting and we all know that dogs pant when they are hot. The moisture in their mouths and on their tongues evaporates when they pant and this takes heat with it. Capillaries in their face and ears expand which means that more blood passes along the surface and more heat can escape. However, the heat loss is only minimum. Any breed of dog can suffer from heatstroke but some breeds are more prone to it. The brachycephalic breed includes Pugs, Boxers and Bulldogs and they all have a characteristically short, snub nose. This means that they cannot lose much heat and can get heat stroke quickly. As you would expect, dogs that have long and thick fur are also more vulnerable as are dogs with medical conditions such as obesity and laryngeal paralysis. The traditional working dog breeds like Retrievers and Labradors cannot stop themselves from running around and exercising vigorously even when the weather is hot and this can lead to overheating. Heatstroke is no joke. A dog suffering from heatstroke will pant and drool excessively, they will have very red gums and a rapid or irregular heart rate. They can go on to develop seizures and to lose consciousness. If they do not receive treatment immediately, they can die. As well as using a cooling vest, there are other things that you should do. Do not expose your dog to hot conditions. When temperatures soar, the best place for a dog is in an air-conditioned room in your house. If you have to take them out in your car, make sure that the air conditioning is turned on and NEVER leave them alone in the car even if the windows are open. Hydration is important so make sure that they always have plenty of fresh water. Try to go for walks at times of the day when it is coolest and keep in the shade if you can. Be alert for any signs of heatstroke. It is important that any cooling vests for dogs that you buy fit your pooch very well. This makes it more comfortable, encourages your dog to wear it and gives it the best chance of working most efficiently. 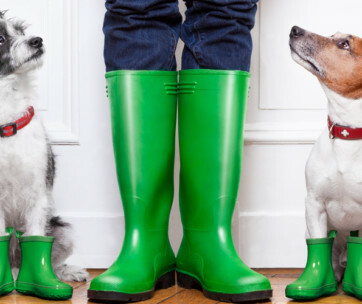 Owners can get very concerned about selecting the correct size for their dog so most brands will provide a size guide with their product description. The one measurement that you should pay most attention to is the girth measurement. It is not hard to measure this. You just need a soft (fabric) measuring tape like the ones that are used in dress-making. Use it to measure the circumference of your dog’s body where the rib cage is widest. It is vital that you get the correct girth size for your dog or it will not be close enough to the skin to work. The length is also important. This is the distance along your dog’s back. You may also need to take the circumference of the neck into account. Your dog’s weight is not that useful because dogs of the same weight can be very different shapes! If you are the proud owner of a bulldog it may take some work to find a vest the fits properly because they have wide, thick necks and deep chests yet their body length is small. Always measure your own dog, but as a general rule of thumb, you will be looking for a dog cooling coat with a girth size of 14-21 inches for a Jack Russel or a Yorkshire Terriers whereas you need a girth size of 35-43 inches to suit a Retriever or a Labrador. Q: What is a Dog Cooling Coat? A: Cooling vests for dogs are a type of jacket worn by dogs. They fasten around your dog’s chest and they help to cool them down. They come in various styles, colors and designs. Some of them work a bit like an ice pack (and need to be frozen) and others use evaporation. They both take heat away from a dog’s body and make them more comfortable. This does not mean that a dog cooling coat will always prevent heatstroke. It is still up to you to take other sensible precautions and to stay vigilant for the signs of heatstroke. Cooling vests can also be useful for providing relief for dogs who are in pain because of a condition such as arthritis. Some senior dogs find them very soothing. Q: How Does a Dog Cooling Vest Work? A: A cooling vest will use one of two possible methods. The first method is evaporation. This essentially copies the way that sweating works in humans and some other species. When liquid water turns into water vapor (a gas) it is called evaporation. This requires energy because the particles in a gas are moving faster than those in a liquid. The energy source for this is heat in the environment and in the case of a cooling vest this is your dog’s body. Evaporation takes away heat and therefore lowers the temperature on the surface of your dog’s skin. To make the vest work, it has to be wet and it will stop working once it has dried out. The second method works like an ice-pack. They have to be placed in a freezer. When they are applied to your dog’s body, the ice becomes water and this requires energy which is provided by your dog’s body. These work better than the evaporation vests when conditions are very humid. Q: How Long Does the Vest Stay Cool? A: This is very variable. An estimate may be given by the manufacturer but it is very dependent on the environmental conditions at the time. The length of time that the vest stays cool will be affected by the humidity, air temperature, sunlight strength, dog breed and activity levels. Most vests can stay wet for up to five hours in ideal conditions but it can be a lot less. Don’t forget that you can ‘reset’ an evaporative vest by wetting it again with a hose-pipe or with water from a stream. Q: How Many Times Can Cooling Jacket be Used Before they Need Replacing? A: This depends on how well you look after them. Most will last for several years before they need to be replaced. Watch out for mold growth as this is unsightly and one of the main reasons that the vests have to be discarded. Make sure that you dry them thoroughly in a well-ventilated area when you are not using them. Q: How do I Clean my Dog Cooling Vest? A: It is important that you follow the washing instructions provided with the cooling vest by the manufacturer. Most of them have to be cleaned in fresh water which is cold and need to be kept away from saltwater. Some can be put in the washing machine but it has to be on a cool cycle and they cannot be machine dried. Our top pick of the best cooling vests for dogs uses evaporation to keep your dog cool. It is very easy to put on and simply has to be soaked in cold water prior to use. Then you fasten it using the buckles. There are several layers of fabric that work together to allow water to escape and take the heat away from your dog’s body. 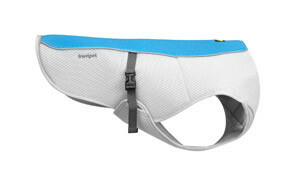 It comes in several sizes and can be used with a Ruffwear harness. The pale color reflects sunlight and it can be washed in the washing machine on a cool cycle.